Powers, Mark. 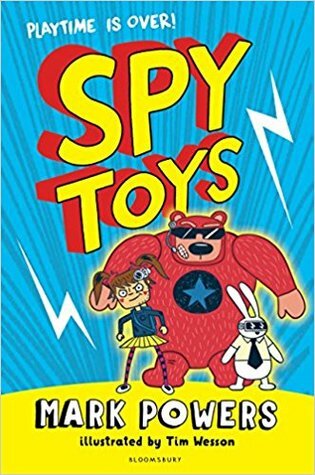 Spy Toys: Playtime is Over! When the Snaztacular Ultrafun toy company finds toys that don't meet their exacting specifications, they are sent to the discard pile. On the way there, Arabella (a doll who hates children) and Dan (a teddy bear who hugs too hard) manage to escape from the factory only to be caught in a net just outside. Luckily, they meet and our rescued by Flax (a toy police rabbit gone rouge). Soon, they are recruited by Auntie Roz, who wants them to be undercover bodyguards. They have very sketchy training and are soon sent to watch the prime minister's son. There is a conspiracy masterminded by genetically engineered cereal mascot, Rusty Flumptrunk, an evil elephant, and it's up to the toys to make sure he doesn't cause too much trouble. They make some mistakes along the way, but in the end, the toys are able to triumph over evil. Weaknesses: The addition of toys makes this more of an elementary school title, since middle school children whose parents are in positions of power are always guarded by other middle school children. What I really think: I'm going back and forth on this one. On the one hand, my struggling readers are also slightly immature, so they might be okay with the toys, as long as there are pictures. On the other, I didn't much care for any of the characters in the book, which makes it hard for me to really get behind the story. Sunny is an older pug who has a comfortable life with her human and her stuffed animals. When Rosy, a new puppy, joins the family, Sunny is not happy. Puppies have a lot of energy and Sunny doesn't care for Rosy's in-your-face personality. Sunny also doesn't like sharing her things with Rosy, especially Mr. Bunny. When Rosy loses Mr. Bunny, Sunny gets angry, but when Rosy runs away, Sunny knows that the puppy has never been on her own alone outside before. What about the mean dogs in the neighborhood? Cars? All of the other dangers? Sunny goes out to find her new and annoying playmate, and comes to realize that having someone else around can be fun. This is the perfect length for an easy reader book. It doesn't look like a "baby book", but has large text and lots of pictures. Unlike graphic novels, which often have very tiny text, this would be a good book for readers transitioning from "I Can Read" books and other shorter readers. This is a great story of irritation and eventual acceptance. I was recently offered the possibility of adopting a seven-year-old toy poodle whose owners were relocating; accepting this offer is contingent on my twelve-year-old Sylvie accepting another dog. I can see Sylvie thinking the exact same things that Sunny is thinking, so this book warmed my heart. 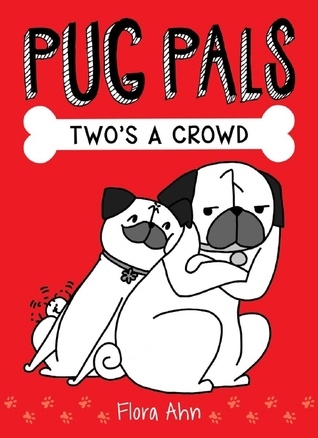 Readers who love pet friendly tales like Selfors' Wedgie and Gizmo or Butler's Kayla and King will enjoy this book, which is the dog equivalent of Surovec's My Pet Human tales.